Vester Voldgade, Copenhagen. Looking north, across Ny Kongensgade. VESTER VOLDGADE, KØBENHAVN (“West Rampart Street, Copenhagen”) is interesting both for its current condition and and its original state. It’s called “Voldgade” because like the boulevards of Paris, it was built where the old city wall stood (the French word “boulevard” comes from the word “bulwark”). As in Paris, allées were planted on the old ramparts, but in Copenhagen the result was different. Parisian boulevards became tree-lined, symmetrical streets (planted in patterns composed of squares, the landscape architect Douglas Duany has pointed out). 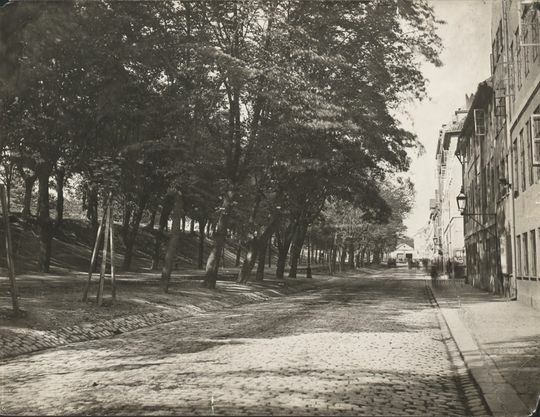 In an old photograph of a section of Vester Voldgade then called “Filosofgangen” (Philosopher Path), we can see that there was a street next to the tree-covered ramparts, with all the trees on the rampart side of the road in what looks like a naturalistic planting. Filosofgangen (Vester Voldgade). Looking north in 1880. Over time, the ramparts were removed and covered by buildings. By the late twentieth century, Vester Voldgade was an ordinary urban arterial, a harsh place for the pedestrian or a cyclist. But a recent redesign of the street brought back the asymmetrical promenade, this time putting it on the eastern side of the street, where it can catch the afternoon sun. 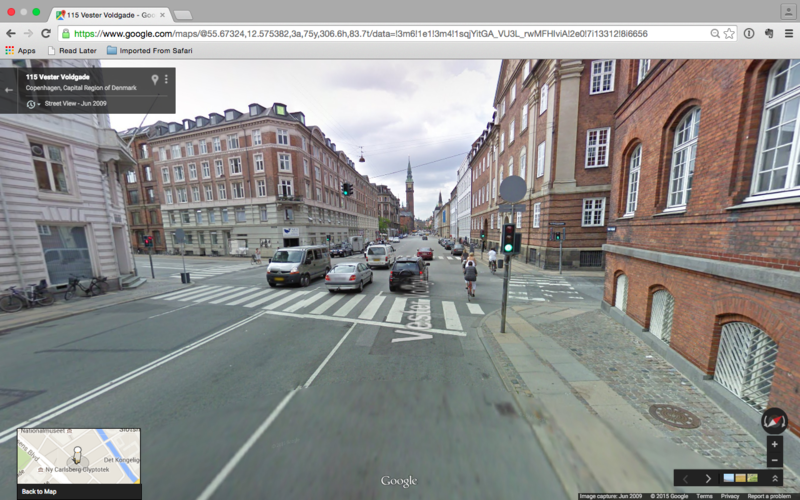 Vester Voldgade, Google Street View, June 2009. Looking north across Ny Kongensgade. Vester Voldgade. The new promenade on the east side of the street. Is this part of a new stage for Copenhagen? Until a few weeks ago I hadn’t been to Copenhagen for many, many years, and my recent trip was only 44 hours long. So I don’t know enough about the city to answer my question, but it seems that it might be. 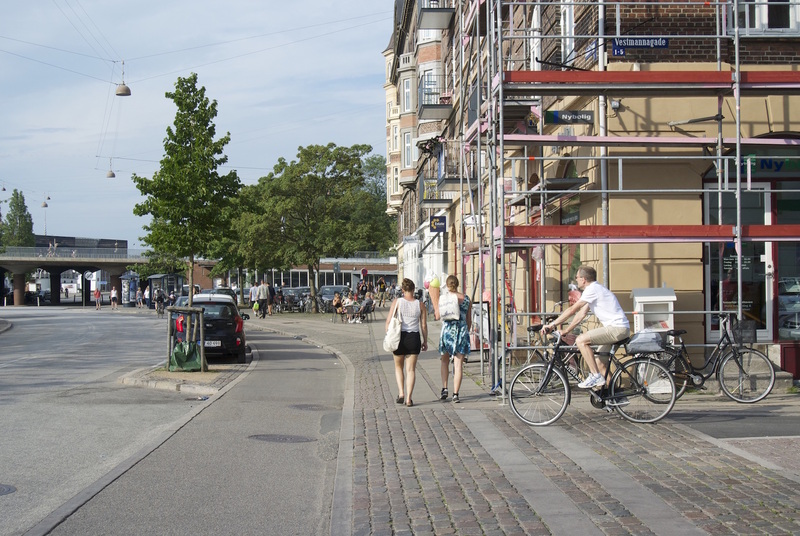 For the last few decades, Copenhagen has been a world leader in the creation of pedestrian streets and cycle tracks, using a different model than the one followed in Amsterdam and the Netherlands. 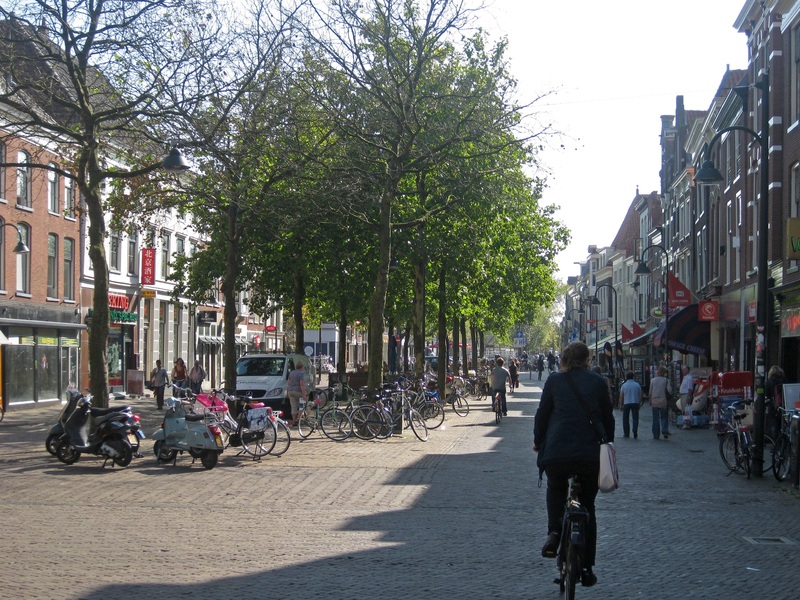 The Dutch idea of Shared Space, made famous by the great traffic engineer Hans Monderman, puts all users on streets where cars go slowly enough to safely share the road. Copenhagen’s model has had more separation of use. 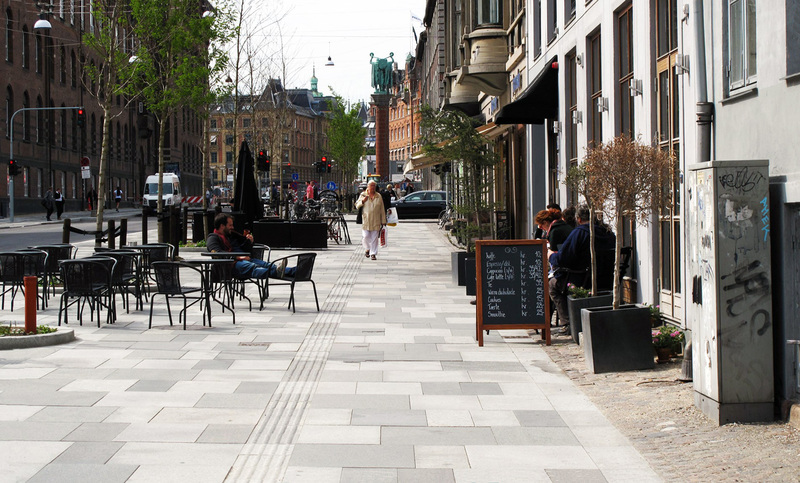 On the one hand, Copenhagen built car-free pedestrian streets, most famously the Strøget, that were not unlike the streets in German and Italian pedestrian zones started around the same time in the early 1960s. 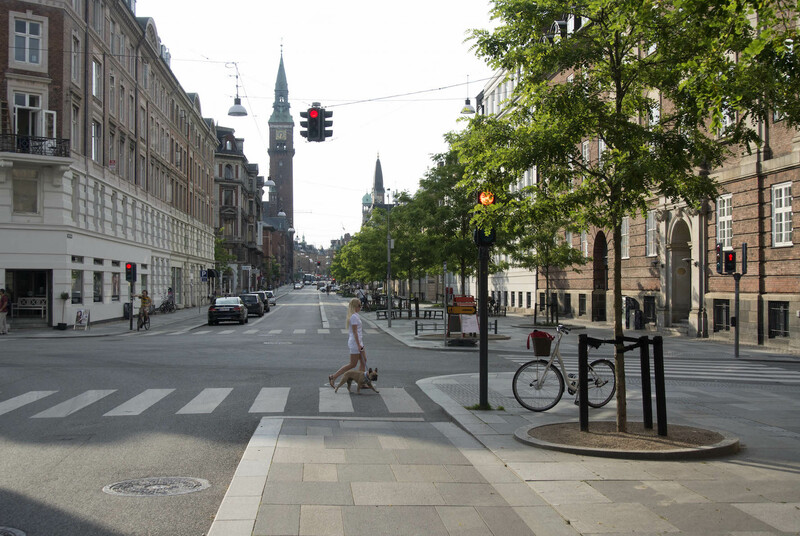 Under the leadership of Alfred Wassard and Jan Gehl, Copenhagen moved forward with careful studies of public preferences and habits that led to more more pedestrian streets. At the same time, the city created an extensive network of utilitarian cycle tracks on streets with busy traffic. The cycle tracks were on a level between the height of the sidewalk and the roadbed, frequently without the parked cars between the track and street that we think of in the US as one of the essential elements of what has become known as the “Copenhagen Lane.” Vesterbrogade, a busy street near Vester Voldgade that accommodates cars, bicycles, and pedestrians is a typical example. Vester Voldgade is hybrid of that model, combining a high-style version of the Copenhagen Lane with the wide, pedestrian-friendly promenade. My impression is that it is part of a new-ish movement towards a greater variety of street types, as seen in Halmvortet and Sønder Boulevard. There are also some new 30 kph and 20 kph / 12.4 mph zones and streets that I haven’t seen. Please comment if you know more about this than I do. Vesterbrogade, Copenhagen. A recent view showing the typical Copenhagen Lane under construction. When the city and COBE Architects looked at redesigning Vester Voldgade, it was an important urban arterial, with a high level of traffic flow and many drivers impatient to get to their destination. On some blocks, the new design took away 2 of the 3 existing traffic lanes and, unusually, took the street from two-way to one-way. 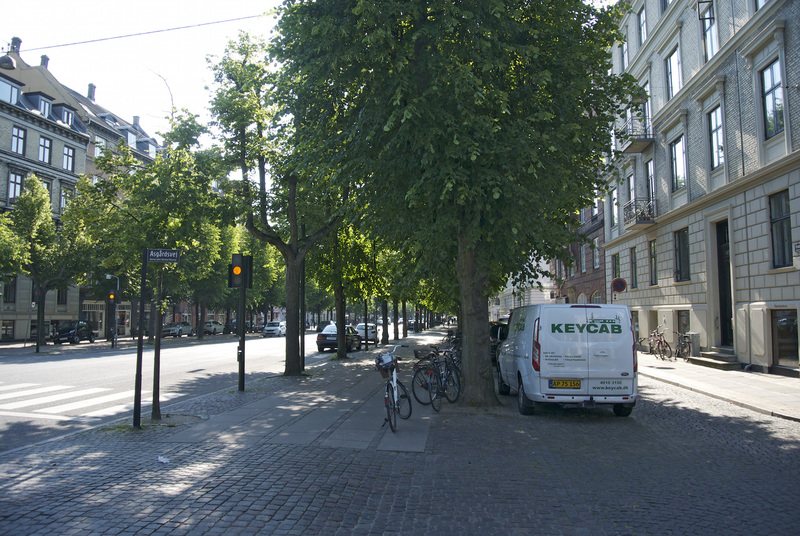 That’s because the traffic lane was narrowed, a Copenhagen bike lane was added, and most significantly, the wide promenade was added on the sunny side of the street, creating an asymmetrical street of the type we promoted in Street Design for some situations. The Western world has had a street design revolution during the last few decades, but the evolution of the revolution can be slow. Vester Voldgade can be seen as a big step forward. Cars naturally drive more slowly than on the wide old street, pedestrians have a more comfortable space, and cyclists have a safe and beautiful place to ride. And, Vester Voldgade brings variety to the street types, which makes for good urbanism. When I rode around Copenhagen for a few hours recently, I immediately noticed, and liked, Vester Voldgade. I got off my bike and took quite a few photos, but when I look at those photos now, I wonder if it would be improved by being a little less “designey,” with fewer special details calling attention to themselves: the unusually broad stone curbs could be more normally-sized stone curbs, and the stone paving could be simpler and less obviously varied, for example. Compare Vester Voldgade to a street like Brabanste Turfmarkt in Delft, an asymmetrical street with more low-key details (see below), and you can see how high-style Vester Voldgade is. Having visited many of the world’s great streets over the last few years I can say definitively that all of them are simple: what is important is the unity of the space. Those are the streets that make the great outdoor rooms that support public life. 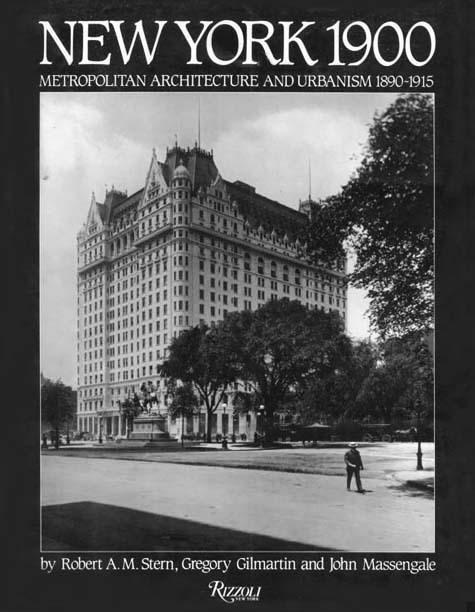 In the twentieth century, we became used to specialists making their particular part of a design job extra-special. More recently, global capitalism has looked on high design as a commodity that produces a good return in the right situation, and the architecture profession has been quick to respond. But the best retailers want passersby looking at their storefront rather than the fancy pavement, because they can tell you how much money in sales per square foot they lose to an overly fancy streetscape. Similarly, the ultimate goal of a street design should be to make the public realm a place where people want to be, not to draw attention to the design itself. In the case of Vester Voldgade, however, those are minor quibbles, especially when we look at the big picture. Vester Voldgade is one of the best new street retrofits I have seen. On absolute terms, it is a good street for walking, cycling, and just hanging out. On top of that, the new street is a greenway that connects to three new squares, and that comes out at the square in front of the City Hall, where it crosses the Strøget. We need more streets like it, and more experiments in how to make “the space between the buildings” better for all us, and not just the drivers. Brabantse Turfmarkt, Delft. Looking south from Burgwal. Brabantse Turfmarkt is sometimes asymmetrical, sometimes shared space, and sometimes pedestrian only. But the details of the street are always simple and beautiful, unifying the space. 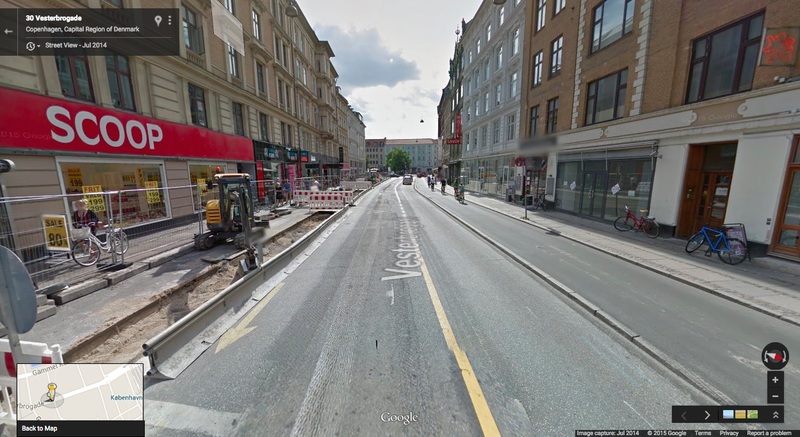 I’m still learning how, when, and where Copenhagen chooses to put parking between the cycle track and the street. It’s clear there is more involved in the decision than just road width, and traffic speed doesn’t seem to be the determinant. Most of the busy streets in Copenhagen seem to have a 40 kilometer per hour (24.8 mph) speed limit (even though over 150 European cities have a top speed of 30 kph / 18.6 mph), and while they almost all have seem to have cycling lanes, some have parking and some don’t. New York City’s version of the Copenhagen lane keeps the bicycle at street level but separates the track from the traffic with parked cars and bold striping (see photo below). 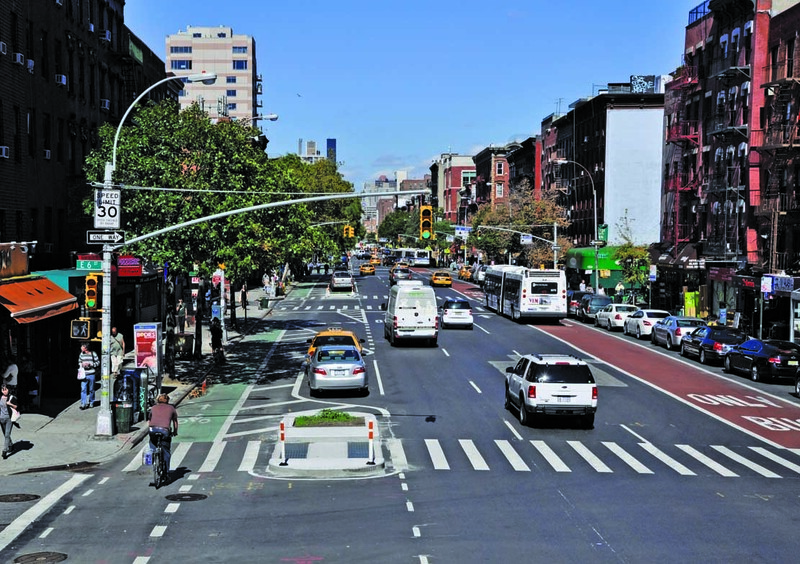 The Copenhagen City Architect once told me that in Denmark they would only use the New York model on roads with speeds of 50 kph (31 mph) or more, and my empirical observation before and after new construction in Manhattan suggests the particular form of New York City’s protected bike lanes makes drivers feel safe going faster than 30 mph. New York’s speed cameras are set to give tickets only to cars going 36 mph or faster, and drivers seem comfortable going 35 to 40 on the one-way avenues. Islands Brygge, Copenhagen. Looking northeast towards Langebro. Unlike the slower Vester Voldgade, Island Brygge has parked cars between the raised cycle track and the roadway. First Avenue, New York, New York. Looking north from East 6th Street. An improvement over the one-way, suburban-style arterial that came before, First Avenue is still a transportation corridor, now with a cycle track. Most of the public realm is still allocated to the free flow of traffic in and out of the city, and it’s painted in a way that clearly marks it as auto space, unsafe for humans. 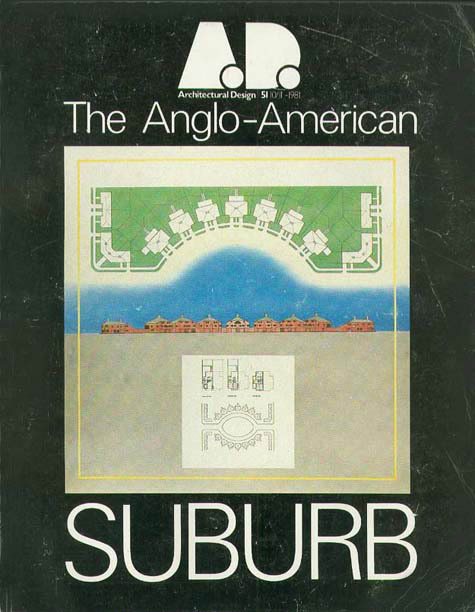 The traffic engineer Rick Hall, one of the authors of the CNU ITE Street Design Manual, call his colleagues who design this way “divisionists,” because they divide the street into parts (and reserve most of it for the automobile). The Copenhagen model has a more equal division between the car, the bicycle, and the pedestrian, while still maintaining traffic flow. It’s also designed at a more human scale, without highway-scale graphics that speed up cars and scare pedestrians. Frederiksberg Alle. Copenhagen. Looking east, across Askårdsvej. Frederiksberg Allé is one of the main streets in a wealthy part of Copenhagen. Is its beautiful, tree-lined cycle track more typical of Germany than Copenhagen? I haven’t spent enough time in Copenhagen to know, but I do know that this cycle track divides the unity of the public space far less than the New York model engineered for the free flow of cars. Cyclists and pedestrians both appreciate the beautiful ride and the summer shade. 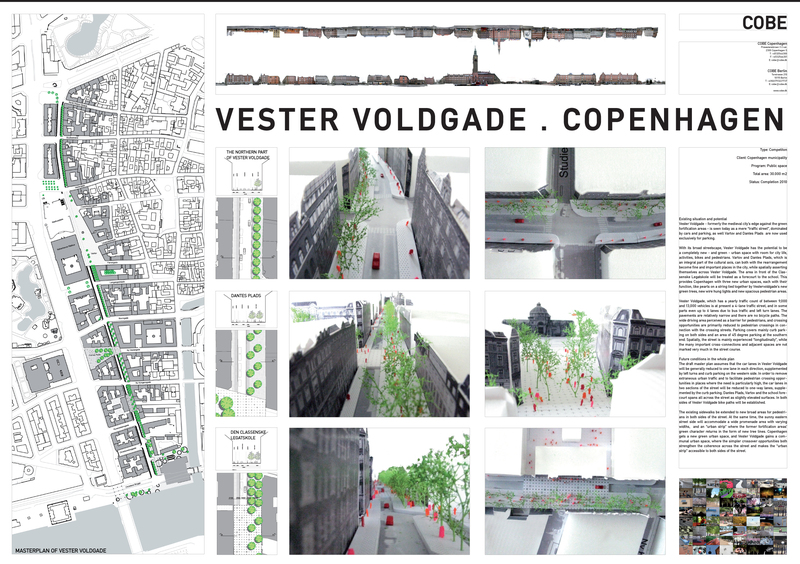 COBE, Vester Voldgade Plan, 2013. 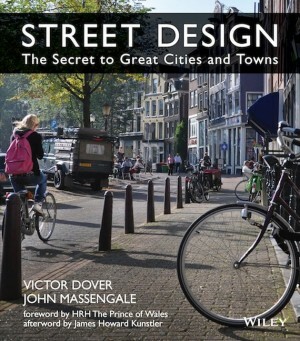 * The first in a new series: streets for the second edition of Street Design. This entry was posted in Good Kind, Pedestrian, Street Design, Street of the Day, Urbanism. Bookmark the permalink.